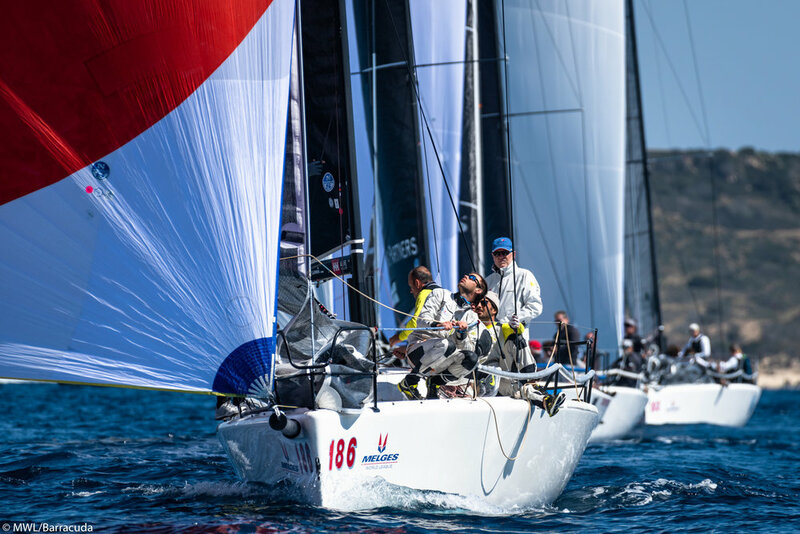 Villasimius (Cagliari), 30 March 2019 – Light breeze does not stop the Melges 32 World League in Villasimius: in warm conditions, the fleet has completed two more races counting on a total of four partials the provisional ranking. Scoring a first and a third, the new provisional leader of the ranking in Villasimius is Caipirinha by Martin Reintjes. The Italian team, led by an expert tactician as Gabriele Benussi, confirmed the good results of the first day, demonstrating to have speed, tactical skills and a high level of boat handling: qualities that allowed the Caipirinha crew to undermine Luigi Giannattasio and his Donino Team from the first place obtained yesterday. The team of Luigi Giannattasio, assisted in the tactical choices by the Majorcan Manuel Weiller, has been slowed down in the run to the victory by the tenth placement collected in the fourth race, started with a rather consistent breeze but ended with the finish line being set at the second windward mark due to a total collapse of the wind. The provisional podium is completed by Torpyone, one of the most iconic team of the Melges 32 class and already European Champion, who, helmed by Edoardo Lupi and tactician Hugo Rocha, achieved success in the second race of the day and managed to overcome a consistent Wilma by the duet Fritz Homann - Nicola Celon. Improving performances for the current World Champion, Tavatuy (Kuznetsov-Neugodnikov), currently fifth in the ranking, ahead of the 2018 Melges 32 World League Champion, Giogi by Matteo Balestrero and tactician Matteo Ivaldi. Among the Corinthians, there is a fierce battle between Homanit by Kilian Holzapfel, Dumbovit by Alessandro Lotto and Flavio Campana and Sjambok by Jens Kuhne, with Homanit boasting a slight margin on the two pursuers. The first event of the Melges 32 World League, organized by Melges Europe in cooperation with Marina di Villasimius and Lega Italiana Vela - Sezione di Villasimius, is coming to an end tomorrow: a maximum of three races can be sailed and the discard of the worst result of the series will come into play after the conclusion of the sixth race. The warning signal for the third and last day of racing in Villasimius is set at 10.30.